Lord Coe says the International Association of Athletics Federations (IAAF) will react robustly to new allegations of doping in the sport. Data leaked to the Sunday Times and a German broadcaster has revealed an "extraordinary extent of cheating" by athletes at the world's biggest events, according to the newspaper. The leaked data shows that a third of all medals in endurance events at Olympics and World Championships between 2001 and 2012 were won by athletes who recorded suspicious tests, according to independent experts used in the investigation. It was further alleged that none of these athletes had been stripped of their medals. 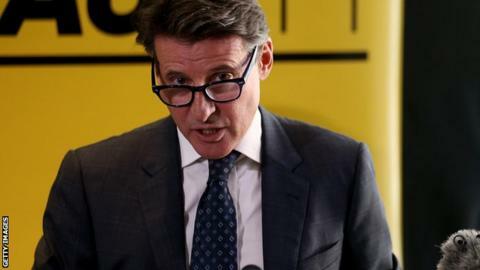 Coe, who is the favourite to win the presidential election against fellow IAAF vice-president Sergey Bubka on 19 August, has made independent testing a key part of his manifesto. Wada's independent commission will investigate the claims in the ARD/WDR documentary Doping - Top Secret: The Shadowy World of Athletics. British athletes have also responded to the news, along with the Russian sports minister and Athletics Kenya - two countries singled out in the latest allegations. British Olympic heptathlon champion Jessica Ennis-Hill lost out on gold at the 2011 World Championships to Russian athlete Tatyana Chernova, who has since served a two-year ban. "It is never good to hear of new possible doping offences in my sport, but if we are to stop a few athletes thinking cheating is acceptable, we have to explore all information that comes to light, however damaging it is for the sport as a whole," she told the Sunday Times. "Like so many other clean athletes I put my faith in the system operated by the IAAF and Wada and focus on training. "I very much hope both organisations can respond to the latest allegations quickly so athletes and fans alike can carry on with confidence believing that progress is being made in tackling doping in our sport." The Sunday Times highlights the case of the women's 1500m at the 2005 World Championships in Helsinki, when four Russian athletes finished in the top five. All four would later serve doping bans but the result still stands in the IAAF record books. Britain's Helen Clitheroe competed in the race, finishing 10th, a result which affected her funding and forced her to race at other distances. "I didn't think there was any cheating going on," said Clitheroe. "After that race I just thought, I'm not as good as them. "It is disappointing because perhaps I was as good as them after all. But that race is something I can never change." Jessica Ennis-Hill's coach Toni Minichiello spoke to BBC Sport about the latest revelations. "There is one viewpoint to take from this data which is, even if athletes are cheating, clearly it is still possible to win major medals at championships," he said. "Jessica has proven - as have other athletes - that cheating is not a necessity to win medals. You can do it through hard work and graft. "Those who cheat have given up on themselves and don't feel they can progress or are not prepared to work hard enough to move forward. "What can you do as a [clean] athlete? Very little. You put your trust in the governing bodies. What you can do is get on with your work. You may have suspicions but we all have that in life. You just have to keep working and concentrate on yourself." In 2011 Briton, Jenny Meadows finished second in the 800m to Yevgeniya Zinurova in the European Indoor Championships, only to be upgraded to gold the following year when the Russian was banned for two years for doping. Meadows has said she has been cheated out of at least three medals. "When I'm training I go down to the track and almost kill myself on a daily basis. It's not pleasant," she told the Sunday Times. "I'm trying to get the most out of my body in a natural way. You really have to have a high pain threshold. "People who are blood-doping don't have to go through that the same way. It's a shortcut. That is really demoralising. It makes you not want to get up in the morning and work so hard. "You want to know every time you stand on that line you are competing on a level playing field. You don't want to think that someone hasn't gone through those gruelling sessions and are just out to rob you of your result." The leaked database has been reviewed by anti-doping experts Robin Parisotto and Michael Ashenden who say Russia emerges as "the blood testing epicentre of the world" with more than 80% of the country's medals won by suspicious athletes. But Russian sports minister Vitaly Mutko described the findings as a "blow" to the IAAF rather than his country. "Russian athletes are checked for doping as much as athletes from other countries," Mutko said. "And, considering that we are leaders in many kinds of sports, these checks for us are even more frequent. Doping problems are faced by all - Russia, America and France. Russian sports minister Vitaly Mutko says "this scandal has no relation to Russia"
"We are amidst such a period of life. There is no proper governance at the IAAF. It is the International Olympic Committee (IOC) that should also bring things into order. Now all this looks like chaos. "This scandal has no relation to Russia. It concerns the world athletic system." According to the Sunday Times, Kenya had 18 medals won by suspicious athletes but Athletics Kenya have described the report as libellous. A statement read: "The timing of the libellous report contained in almost half of the 55-minute documentary which alleges widespread systematic doping in Kenya is extremely suspect and ill-motivated, coming on the day we selected our team for the IAAF World Championships (starting on 22 August). "The federation always welcomes any information which would help fight the vice of doping. "But we cannot fail to point out that the documentary is an attempt to smear our runners with unwarranted suspicion as they prepare to undertake duty for their country in Beijing. "On claims of financial impropriety on our top leadership, past and present, we have instructed our legal team to study the documentary with a view of bringing legal action against the TV station and the author." "The IAAF is aware of serious allegations made against the integrity and competence of its anti-doping programme. "The relevant allegations were broadcast on WDR (ARD) in Germany yesterday and have been repeated in an article in the Sunday Times newspaper today. They are largely based on analysis of an IAAF database of private and confidential medical data which has been obtained without consent. "The IAAF is now preparing a detailed response to both media outlets and will reserve the right to take any follow-up action necessary to protect the rights of the IAAF and its athletes."